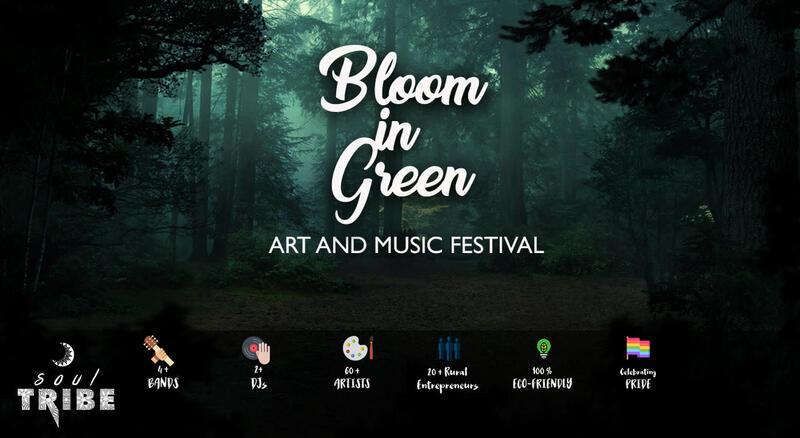 Bloom in green or BIG festival is a three days art and music festival which happens in Agumbe, the Malgudi Town of Karnataka. 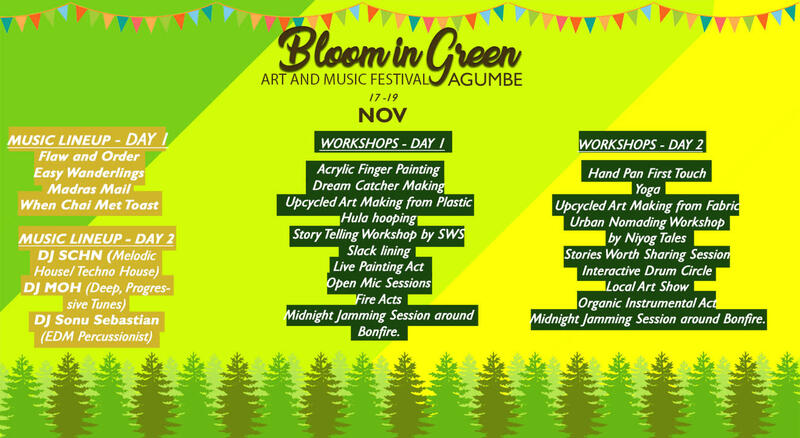 It is an eclectic mix of music, art and personal growth and is organized by Soul Tribe Community which is based out in Bangalore. The vision of the company is to build a thriving community which work for both personal transformation and steering the transformation of culture toward sustainability through art and music. The new edition of BIG festival is expecting a footfall of nearly 350 participants who camps at the venue for three days. The age group of the participants is expected to be spanning from 21 to 35 yr. The event will have various art workshops painting, dream catcher making and hula hooping etc. and sustainablilty oriented workshops like up-cycled art making etc. and live music band performance in the nights. Midnight Jamming Session around Bonfire. How can we commute from Bangalore to the venue? We have arranged a transportation with extra cost. Call to 9663712223 for more details. Also one can take a bus in KSRTC or Redbus ( only 2 buses) to Agumbe. You have to step down at Guddekeri which is 7 km before Agumbe. Follow our signs to the venue or take an auto. How can we commute from Kochi and different places to the venue? One can take a bus or train to Udupi. You have private and transport buses running from Udupi to Agumbe every half an hour. The last bus is at 6.30 PM. Can Children Attend the festival? Are we allowed to bring food/drink into the festival? Food and Drinks are not allowed to bring your own. You can get the same from the venue as well since there will be stalls for food and drinks at the venue. You will require a form (Passport/Driving Licence) ID to purchase alcohol if you are lucky enough to look under 25. What is the size of tent? What is not allowed onto the festival site?